There are several manufacturers that produce quality wooden balance bikes, and another option is the Jiggy Wooden Balance Bike. The bike is manufactured by Kidzmotion, who are a small and family run business that offer a range of balance bikes and other products. This is also the sister bike to the Oowee Pink Balance Bike. 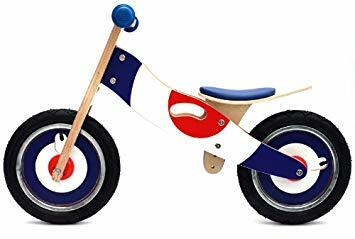 As you can see from the image, the Jiggy Wooden Balance Bike scores well on appearance, with a retro style that offers a red, white and blue design than runs throughout the bike including the frame, the tyres and the handlebars. The frame is made from birch plywood, so this means that it is lightweight at 4kg and good for the environment. The soft padded seat provides a comfortable ride and can be adjusted to three heights from 34cm, 36cm and 38cm. This means that the Jiggy Wooden Balance Bike would suit children from 2 years old and upwards – but make sure you read our balance bike seat guide and measure the child’s inseam first! Other features include soft plastic handlebars with safety ends, and a carry handle so the bike is easy to transport when the rider has had enough and just wants to walk. We also think the wheels look great with a blue circular infill and inflatable tyres – just like a proper bike. Check out the other sorts of tyres that are used on balance bikes in our balance bike tyres guide. This is a stylish and sleek wooden balance bike that will look great in the playground, on the street or at the local park. It also provides fantastic value as it is available for just £47.99. The design means that it will suit both boys and girls – so it is ideal if you have younger brothers and sisters waiting in line that the bike can be passed on to. The Jiggy Wooden Balance bike's nearest competitor is the wooden Boppi balance bike. These bikes are priced at around £35 and are available in a number of different designs. Good luck in searching for the best balance bike!